Mood board: Paris’ S/S 2018 season is one marked by the debuts of new creative heads – from Olivier Lapidus’ outing for Lanvin earlier this week to Claire Waight Keller’s showcase at Givenchy on Sunday. 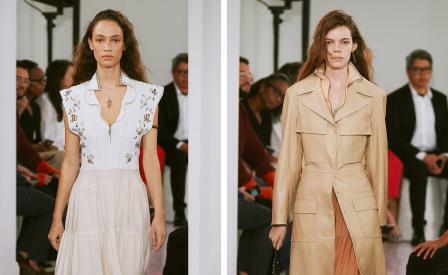 Chloé’s S/S 2018 collection was the inaugural offering from Natacha Ramsay-Levi, the former number two to Louis Vuitton’s creative director Nicolas Ghesquiére (who was sat pride of place at the show). The Chloé girl has always been chic and bohemian- an effortless, insouciant dresser. Ramsay-Levi looked to these traits in her marvellous debut, with floaty blouses, light crocodile print skirts and short dresses with superstitious symbols like eyes and hands. There were also velvet suits and all in ones with equine prints, and an array of leather outerwear in organic tones. Best in show: There was a touch more toughness and edge to Ramsay-Levi’s bohemian – a girl who wears skinny tailored trousers with waistcoats, or a trailing frilly blouse with a Western style slip on shoe, and a ruffled mini skirt with calf high army boots in coloured snakeskin. Finishing touches: For added edge, mini skirts were embellished with graphic studs, and blouses were finished with rows of hoops which resembled punky earrings.